Plastic Storage Sheds - Who Has The Best? Plastic storage sheds are an affordable and durable alternative to timber storage facilities, and more and more people every year are discovering the advantages they bring. Unlike wooden sheds, there’s no need to worry about rot or insect attack, or the time and money it takes to top up preservative treatments. And of course they can’t rust like metal sheds can, so this makes them even better value for money. 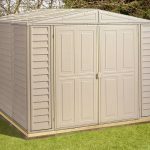 With an increasing number of models to choose from, WhatShed have put together this handy guide to help you find the twenty best plastic storage sheds that can be bought online in the UK today. 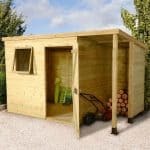 For the purposes of this list we have defined a storage shed as a building with a base area of less than sixty square feet, as these are garden buildings made primarily for storage purposes in domestic gardens. We’ve also discounted resin storage sheds, as we have another league table dedicated specifically to them. We then looked at several essential factors, including price, value for money, durability, design, and aesthetic appeal. In this way we have created a list of the twenty best plastic storage sheds that are suitable for all budgets and all gardens. Plastic storage sheds proved to be a diverse category, and it was very difficult to decide an overall winner, so it’s well done to the BillyOh Retford 8 x 6 Premium Woodgrain Plastic Storage Shed which takes the number one position thanks to its great value for money, durability, good looks, and value adding features. Whether you need timber or plastic storage sheds, playhouses or workshops, WhatShed bring you detailed and independent reviews that can help you make the right purchasing decisions time after time. Plastic storage sheds can provide significant advantages over their counterparts made of timber or even metal. Because they won’t rot or rust they are virtually maintenance free, and this can save considerable time and money over the typical lifetime of a garden building. Some people, however, don’t like the ideal of having a plastic shed in their garden; this beautiful Retford shed from BillyOh could convert them. We found its appearance very striking, because its light brown paintwork complete with woodgrain effect looks very much like wood. 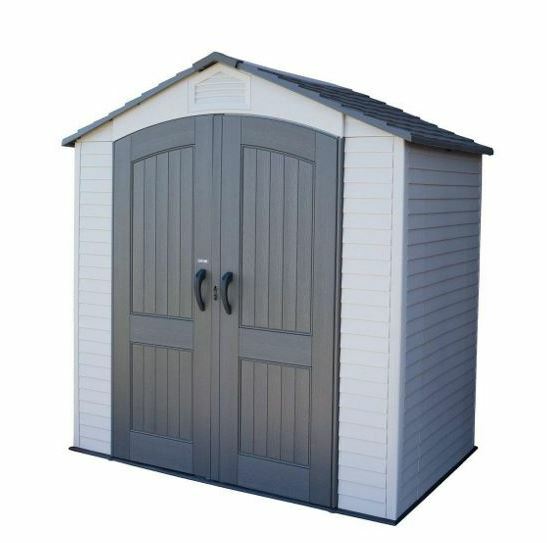 With a long warranty period and a very low asking price as well for a shed with base dimensions of 2.40 x 1.60m, we have no hesitation in placing this at the very top of our league table of plastic storage sheds. It’s not just its stylish looks that we enjoyed, as it’s supremely functional as well. For a start, there are wide opening double doors that open out to 1.54m, making it easy to transport even the widest and bulkiest of objects in and out without too much difficulty. A skylight takes up the central portion of the roof as well, which is something that we always like to see, as is the generous 15 year warranty supplied by the manufacturer. 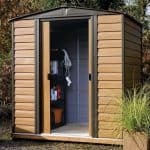 We’ve reviewed lots of Palram sheds, and this six foot by eight foot model is a perfect example of why they’re so popular. It’s one of the larger sheds in our top twenty league table, meaning that it’s more than large enough for lawnmowers, tools, or even motorcycles. It also represents very good value for money at a price of less than four hundred and fifty pounds, and has a number of design features that elevate it above the majority of its contemporaries. 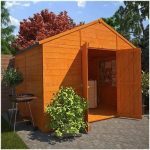 These factors added together are enough for us to proclaim it as the second best plastic storage shed that can be bought online in the UK today. One of the extra features that we liked so much was the inclusion of skylights within the apex roof. As this shed is large enough to spend time inside the profusion of natural light makes it a comfortable and pleasant environment to be in, as well as meaning that there’s no need to install an artificial light source. We also liked the light grey colour scheme applied to the cladding, and although we would have preferred the warranty period to be a little longer than the 10 years supplied here, we wouldn’t be at all surprised to find it lasting much longer without any problems becoming apparent. The DuraMate range of plastic storage sheds look like many people’s idea of a typical PVC shed, being ivory coloured and window free. We still found this to be an attractive garden building, however, thanks to the detailing on the double doors and gable and the overlap effect applied to the cladding. It has a very contemporary look about it, and we feel that it will fit in particularly well in gardens that already have white PVC elements to them such as greenhouses or conservatories. 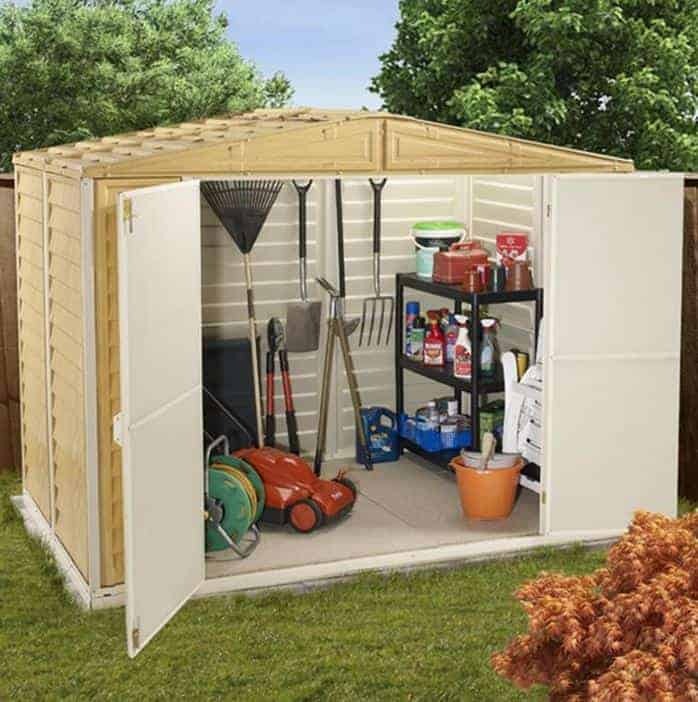 There’s a lot of storage space available in an eight by five shed, and as the apex roof reaches up to a peak height of 1.86m, over six feet, you won’t have to worry about storing tall items. 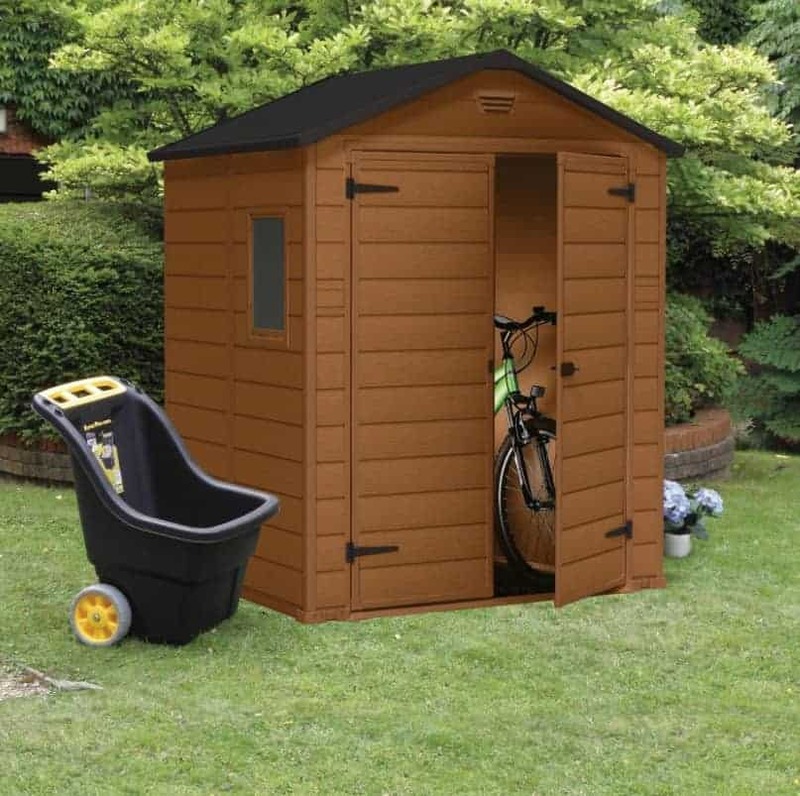 For such an accommodating shed it offers very good value at a price of under four hundred pounds and with a 10 year warranty included as standard, and it’s this that carries it into the top three plastic storage sheds that can be found online right now. Being rust and rot free, and flame resistant as well, this is a no maintenance and no worries shed that should look just as good, and perform just as well, in ten years time and beyond. 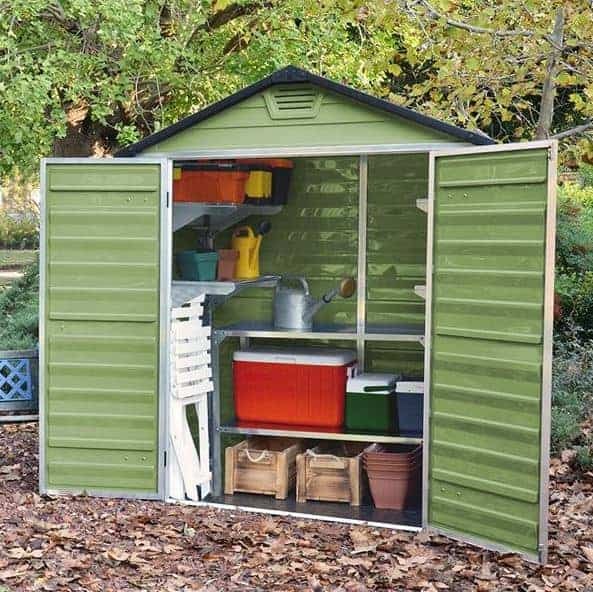 Plastic storage sheds are an ideal choice for people who need extra storage for their gardening tools and equipment, and yet don’t want to have to carry out the regular maintenance that timber sheds often call for. We know, however, that some people don’t like anything that looks too plastic in their garden: that’s where this polycarbonate shed from Palram scores very highly, finished in an amber colour it resembles wood from a distance, and we found it to be attractive even at close range. 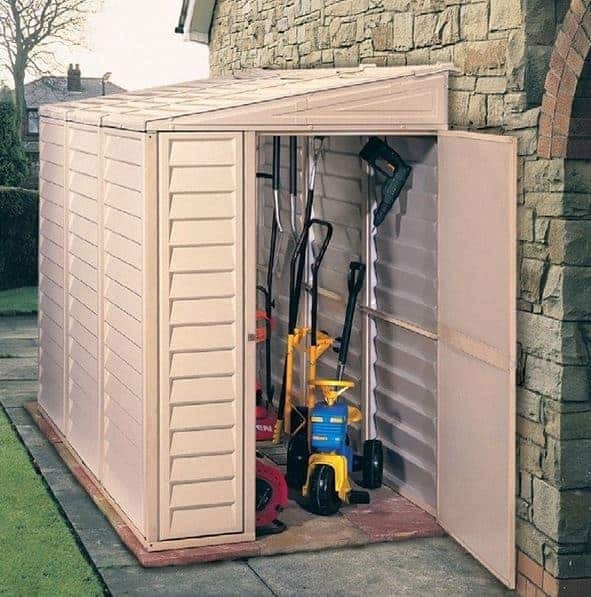 It also offers exceptional value for money for a shed with base dimensions of 1.87 x 1.53m, and with value adding features as standard as well, this is deservedly number one in our plastic storage shed league table. One of the value adding features we really liked is a skylight that’s built into the roof. This means that you won’t have to install an artificial source of lighting, and yet there’s also no way that passers by can see if anything of value is being stored within. 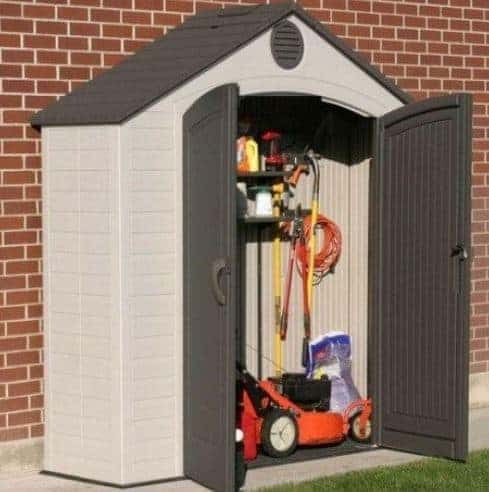 It’s a feature that we love to see on plastic storage sheds, and yet we wouldn’t necessarily expect to see it on such a well priced shed. With a strong steel frame and a ten year warranty as well, this is a tough storage solution you can trust. Most of the plastic storage sheds we review have an apex roof, and so this model from BillyOh instantly caught our eye thanks to its pent roof. This gives it an exciting yet traditional look, and it also means that the roof doesn’t stand out too obtrusively; this can make it a less obvious and therefore more secure storage facility. 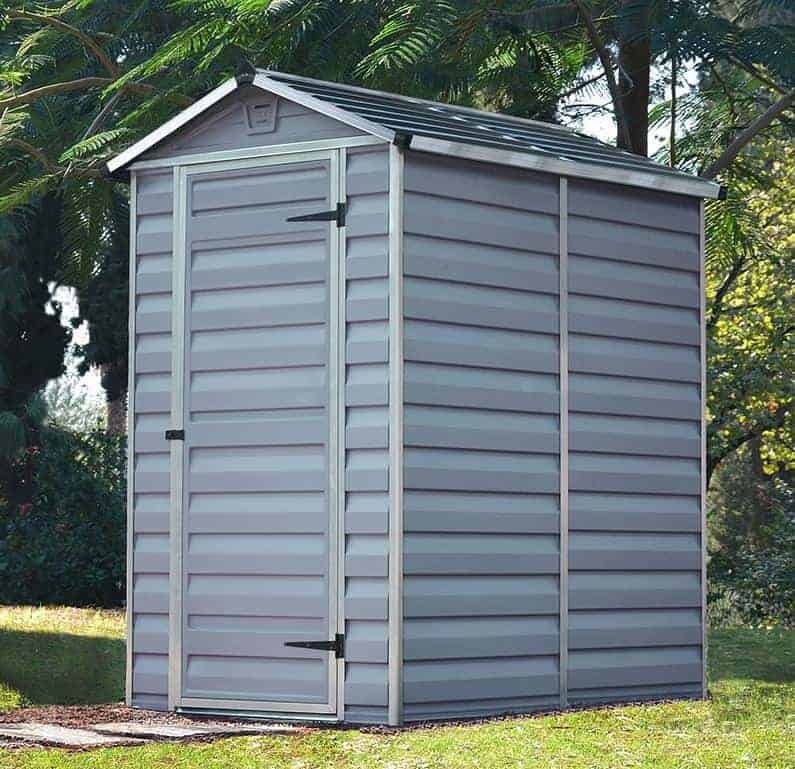 Although it has a compact width of 1.21m, it’s also one of the deepest plastic storage sheds we’ve reviewed, at 2.40m, and despite the pent styling the roof height of 1.85m is still tall enough to store most items in. It also represents very good value, especially as it comes with a useful foundation kit, and when combined with its good looks this is enough to take up a spot in our league table. One reason, other than the pent roof, that we found this shed so pleasing on the eye is that the vinyl cladding has been applied in a shiplap effect and then given an artificial woodgrain finish. It’s like nothing we’ve seen on any of the other plastic storage sheds we’ve looked at, and it’s sure to become a conversation piece with your neighbours and friends. One other feature that we particularly liked was the 15 year manufacturer’s guarantee, which is as long as that given with any shed in this top ten league table. One of the great things about plastic storage sheds when compared to resin storage sheds is that they come in a wider array of styles and colours, meaning that the customer can find one that suits their taste and their garden. This is the first grey coloured shed in our league table, and its subtle colouring should help it fit in well with most environments. It was certainly a look that we liked, especially when applied to the slim profile of this shed which has a width at base of 1.09m and a depth at base of 1.74m. This makes it a good choice for narrow gardens where space is at a premium, and we also feel that it represents very good value for money. When we first looked at it, it resembled a metal security shed in some ways as it has no external windows. When the single hinged door is opened, however, you’ll find that there’s a plentiful supply of light inside. That’s because once again the roof hides translucent panels that act as a skylight, allowing natural light in but keeping prying eyes out. These plastic storage sheds also come with a 10 year warranty, but with a strong aluminium frame supporting it we would expect them to last much longer than that without any problems. 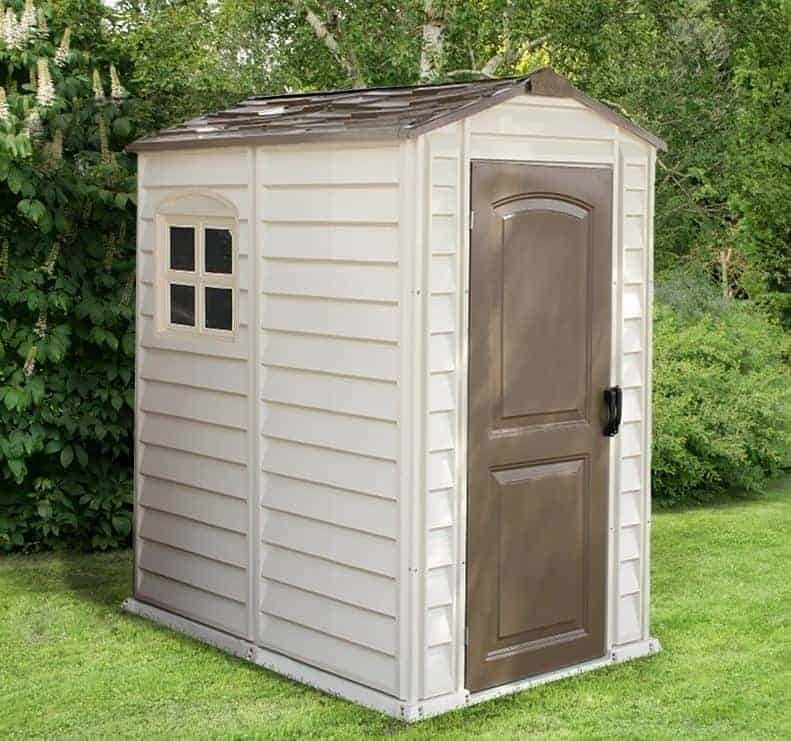 This PVC shed takes its inspiration stylistically from resin sheds in that it is off white in colour with a chocolate brown single door and roof. This is very much a classic combination when it comes to plastic storage sheds, and we feel it will fit in particularly well with properties that already have white PVC in evidence for their rooflines, doors or a conservatory. Once again we feel this is a very good value shed, especially as it feels very tough and stable once installed thanks to its hot dipped galvanised steel frame. This is a very high quality and very rigid metal, and it’s not something we always find used on a plastic shed costing a little over three hundred pounds. This doesn’t boast a skylight but it does have a square window at the side to let light reach the interior. We were pleased to see that the window was plastic too, made of clear styrene in fact, as this means that it’s shatter resistant and therefore safe to use in areas where children may be playing. We also liked the long 15 year manufacturer’s guarantee, which always provides peace of mind when applied to plastic storage sheds, as it shows the faith that Duramax have in the quality of their product. 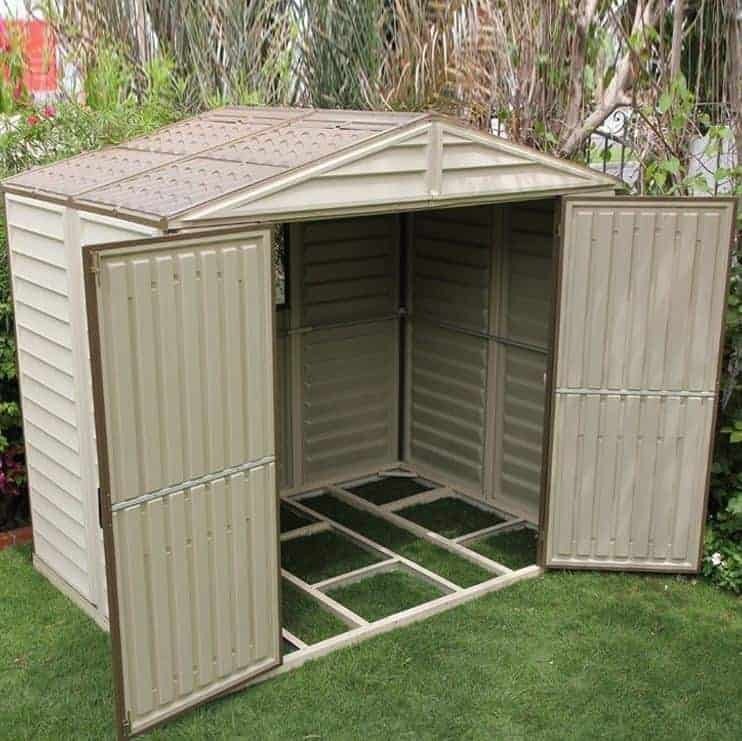 Grosfillex make a range of very high quality and very attractive PVC garden buildings, and this smallest model in their range meets our criteria for plastic storage sheds. It’s also one of the most attractive sheds we’ve seen made from any substrate, and this is enough to earn it a place inside the top half of the league table, even though its relatively high price for a shed with a base width of 2.14 x 1.88m had to be taken into account. From the first time we saw this shed we found its unique white and pale blue colour scheme to be stunning, and this is enhanced by the very stylish design. The overhanging roof, with handy vents underneath, is more pronounced than on any of the other plastic storage sheds we’ve reviewed, and this is not only very eye catching it’s also excellent at sweeping rain and snow away and keeping the interior dry. We also liked the centrally positioned window at the top of the single door, and we were especially to pleased to see that the door featured a key operated lock, which again is unique within this WhatShed league table. We would have liked a slightly longer warranty period than the 10 years provided here, but if you don’t mind paying nine hundred pounds for a plastic shed of the highest quality then this could be the one for you. We now move from the most expensive to one of the cheapest plastic storage sheds in our league table, but they both have signs of quality running right through them. Once again, as in the pent roofed shed we came across earlier, this has the highly attractive light brown woodgrain effect cladding. We were also pleased to see that hot dipped galvanised steel had been used for the frame, which means that it should prove stable and reliable even if it’s going to be sited in windy areas. The 15 year warranty provided shows just how durable both the frame and cladding should be, which makes the price tag of well under three hundred pounds even better value for money. 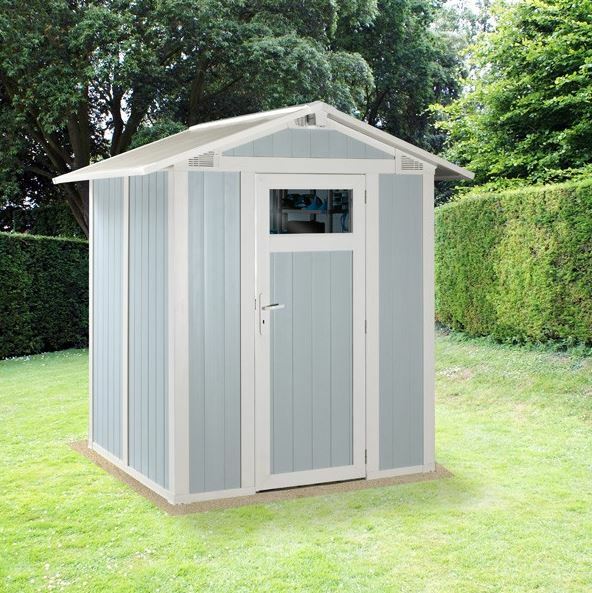 This shed has a base width of 1.73m and a base depth of 0.96m, and thanks to the apex roof it has a little extra head room with a peak height of 1.99m. 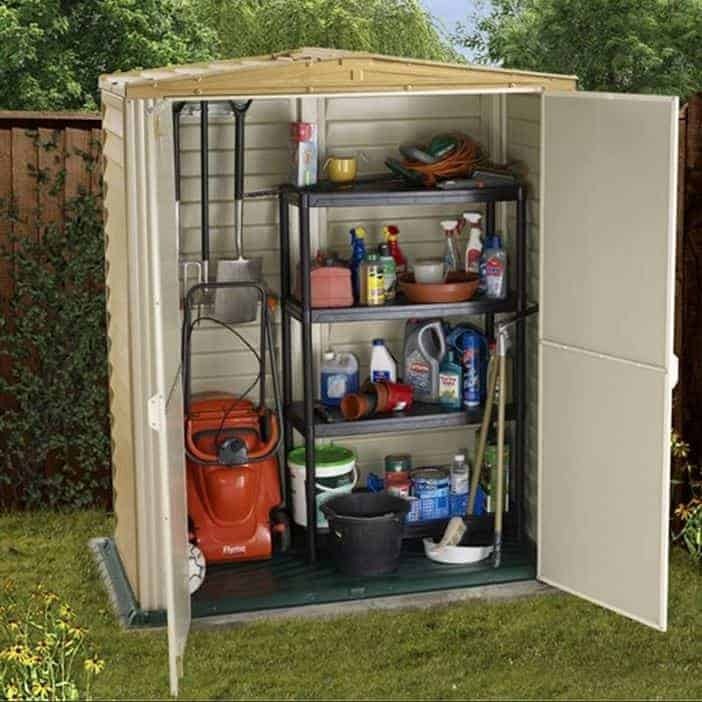 There’s enough room in these plastic storage sheds to fit a standard lawnmower inside as well as a good selection of gardening tools, and the wide opening double doors make it very easy to get items in and out. One extra feature that we really approved of was the translucent strip at the summit of the roof. It’s only thin, but it still allows enough light to enter in to make storage and retrieval a simple task on a sunny day. This is the largest of all the plastic storage sheds in our top ten league table, with a base width of 1.90m complemented by a base depth of 1.92m. It’s also the tallest with the apex roof reaching a peak height of 2.12m. This means that you can store a large quantity of items inside, and yet it’s still not so large that it will take up too much space for people whose garden space is limited. When we first saw this building we were instantly struck by the brown coloured double doors that dominate the frontage and stand out against the beige shiplap effect cladding. They are very wide opening, and mean that there’s no difficulty in bringing tall, wide, or bulky items inside.Because the PVC cladding is fireproof, as well as being covered by a 10 year warranty, we also feel it could be an ideal all weather storage facility for motorbikes or flammable materials such as paint or oils. One thing that differentiates this from all the other plastic storage sheds is that it has no windows or skylights. This means that you may need to use a torch or install an artificial light source, but it also makes it very secure particularly if a padlock is added to the holed handles. The Lifetime range of plastic storage sheds have lots of character, and as they always catch our eye they’re likely to do the same for your friends and family as well. The charcoal grey and white colour scheme that they adopt is simple and yet very effective, and the contrasting doors seem to stand out even further thanks to the curved rather than straight edges at the top. 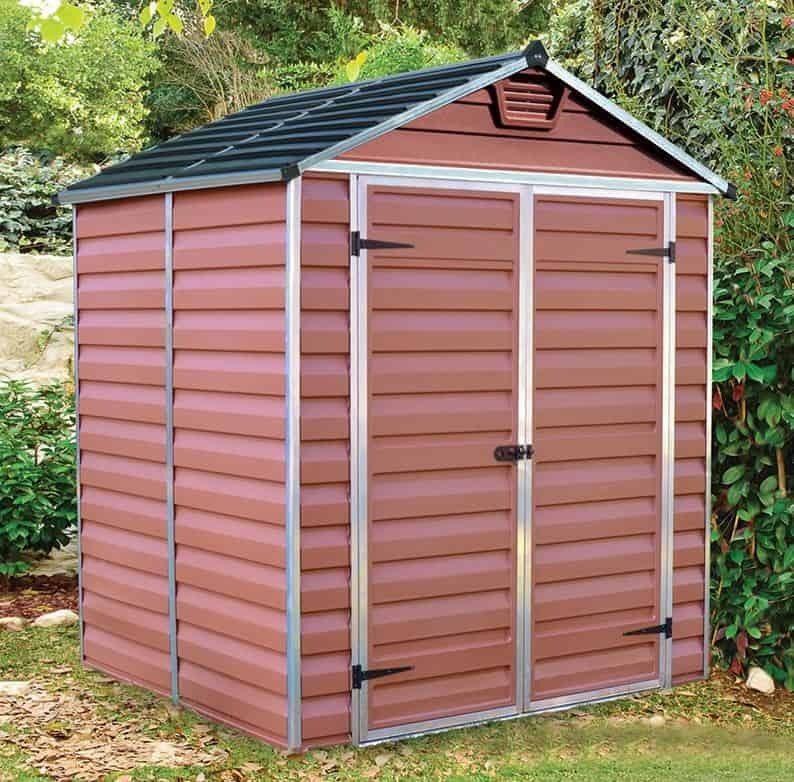 Thankfully this doesn’t mean that they lose any functionality however, as the eaves and apex are considerably taller than we usually see on the mid sized plastic sheds we review. You won’t have to duck down when using the doors, and of course this can make it safer and easier when carrying heavy or oddly shaped items in or out. The apex roof which gives it this height is supported by tough steel frames, and that’s one of the reasons that this feels like one of the most stable and sturdy plastic storage sheds we’ve reviewed, once it’s been assembled. We also liked the shatter resistant window on the side panel, although as it potentially allows people to see what’s being stored inside we would also recommend the purchase of a padlock to improve security. It’s not the cheapest seven by seven shed that we’ve reviewed, which accounts for its placing outside of our top ten, but it is one of the strongest and one of the best looking. Most of the Duramax plastic storage sheds we’ve reviewed have all white cladding that gives it a contemporary, almost minimalist feel, but we liked the contrast provided by the dark brown doors and detailing on this model. We feel it gives this a more traditional look, and it should increase its appeal among those who’ve only had wooden garden sheds in their gardens before. Equally appealing of course, is the longevity that typically comes with a plastic shed. Although this only comes with a ten year warranty, which along with the higher than average asking price has had an effect on its final placing in our league table, it should prove to be much more durable than that suggests. 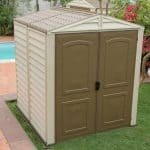 From the moment we saw it, we could tell that this was amongst the highest quality plastic storage sheds that we’ve reviewed. An example of this is the use of galvanised steel for the framing, and also that this has then been powder coated to give it an extra protective layer against rainwater and therefore rust. We also liked the inclusion of a foundation kit as standard, which is a very useful addition if you don’t have a suitably sized and suitably level area of concrete on which to site it at the beginning. We’ve reviewed lots of Lifetime sheds, and whilst they are always high quality and very original buildings, the majority of them are too large to be considered truly as plastic storage sheds. 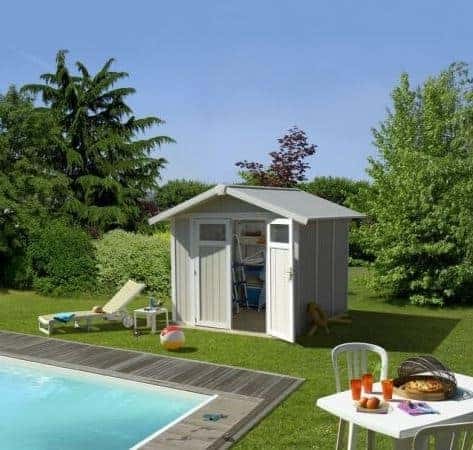 This is their entry level model, however, and with base dimensions of 2.39 x 0.71m it’s an ideal building in which to store gardening tools and equipment, particularly if the garden is small too and therefore has limited space available. 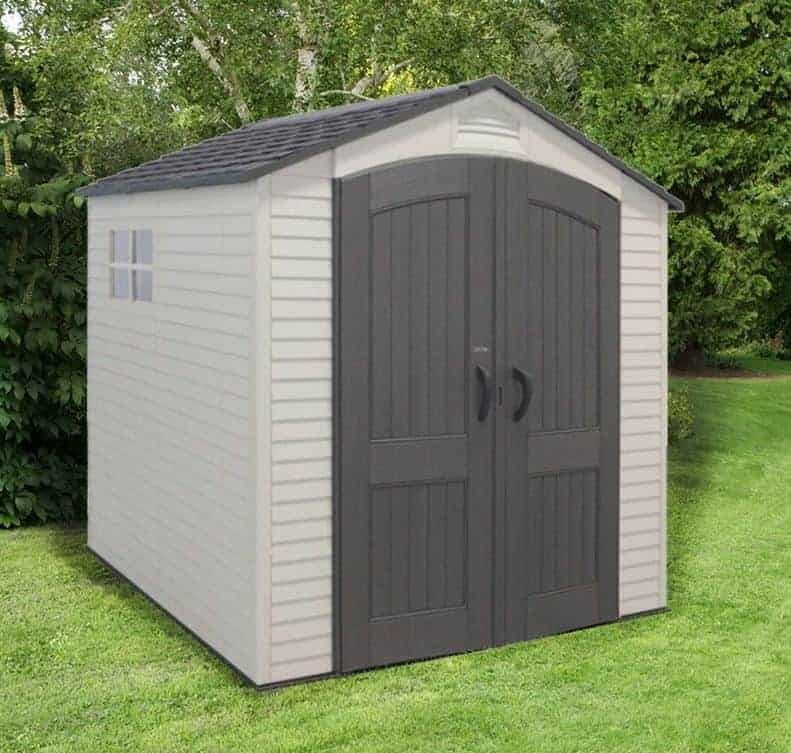 This looks like none of the other plastic storage sheds we’ve reviewed, and the sharply sided apex roof combined with the shallow depth and wide frontage give it an almost sentry box like appearance that really caught our eye. The double doors, as well, have a look of their very own. They have a neatly curved top that adds a very stylish touch, and above them is a generously sized circular vent. This is very important, as plastic sheds can suffer from condensation if they don’t get enough airflow through them, and it also adds to the overall originality of the shed. This has a lot to recommend it, including a 10 year warranty period, and it’s only a price tag that’s significantly above average which prevents this from achieving a higher position in our top ten league table. This is the third of the Lifetime plastic storage sheds to make it into our list of the top twenty examples that can be bought online in the UK today. This shows just how reliable a manufacturer they are, and the high quality of components that they use, although once again this model comes with a slightly higher than average price tag, and this is why it finds a place in the bottom half of our league table rather than the top half. Stylistically it has a lot in common with the other apex roofed plastic storage sheds from this manufacturer, including the arched double doors, but that’s no bad thing as they are after all among the most eye catching plastic sheds that we see. Where this particular model differs however is that, being designed primarily for storage purposes, it doesn’t have a window. This in itself of course can act as a valuable security feature, and it can be an important consideration if you’re thinking about keeping anything valuable locked inside with the addition of a padlock. We were pleased to find that it does have a central vent, however, so as well as helping with the battle against condensation the shed feels cool and welcoming even on warm days. 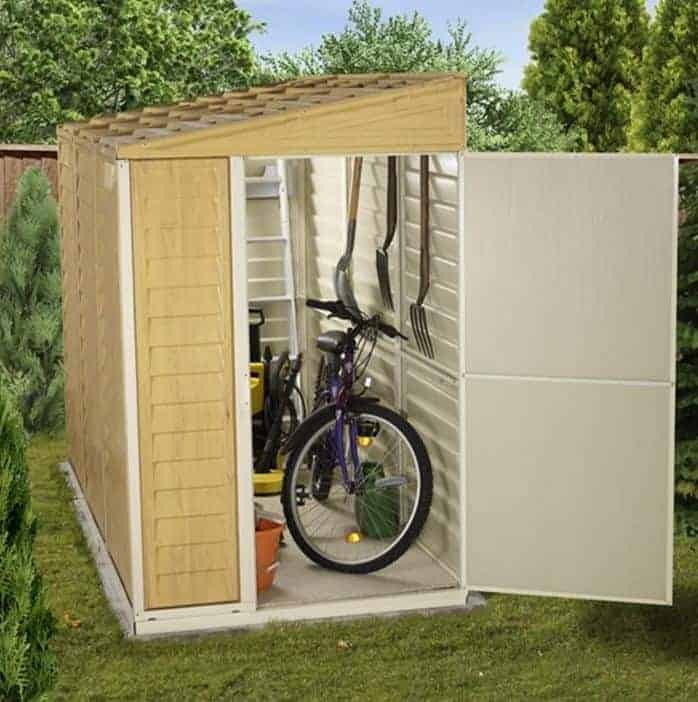 This tough garden building is radically different from any other to be found in our league table of the twenty best plastic storage sheds that can be bought online in the UK, and that’s because it has a lean-to design. This brings advantages and disadvantages; on the down side it limits the areas where it can be positioned, but on the plus side it can be a much more robust and stable building thanks to the support and weather protection that’s given to it by the house wall alongside it. Strength is the key element of this shed, and indeed is one of the reasons why it earns a place on our list. At its heart is a thick and strong galvanised steel frame, which then has the weather and rot resistant PVC cladding upon it. The result is a garden building that you won’t have to worry about in strong winds or heavy rain, and we were pleased to see that the manufacturer shares our confidence and has provided a 15 year warranty. With base dimensions of 1.22 x 2.38m this isn’t one of the largest plastic storage sheds we’ve seen for the price, but if you’re looking for a lean to shed that’s low on maintenance then this could be the perfect solution. 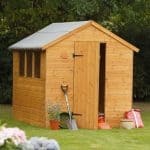 This mid sized shed is a great purchase for the keen gardener who wants extra storage space for his tools and mowers. As it’s also rust and fire resistant, it can also double up as an all year round storage area for motorbikes or cycles, and the wide opening and taller than average double doors make it easy to store and retrieve almost any object. As always with Lifetime’s plastic storage sheds, and we know that many people don’t mind paying a little extra, as they will have to on this occasion, for a shed that attracts attention for all the right reasons. Inside the shed is designed to feel airy and roomy, despite the base area of 2.00 x 1.40m being among the smallest in our WhatShed league table of plastic storage sheds. One reason for this is the very accommodating height of 2.40m and another is the two covered vents that allow fresh air to flow naturally throughout. There’s a skylight as well, which runs the full length of the building to ensure that every corner receives enough light. One other feature we liked, and which we don’t see replicated very often, was the inclusion of two integrated corner shelves, which make an ideal place for the storage of smaller items. We’ve seen several plastic storage sheds that have green cladding, but not in the light, almost lime, green shade used here. It’s very eye catching, and we feel that it will blend in very well with a green garden background. Unlike some of the plastic sheds of yesteryear, the polycarbonate cladding here is UV resistant, so you won’t have to worry about the colours fading or yellowing over time. This is another one of the plastic storage sheds that has a skylight incorporated into the roof, which makes it an ideal choice if you’re thinking about storing anything valuable inside. Because opportune thieves will have no way of seeing what’s inside as they pass by, they’re much less likely to target it. Another feature we liked is the slip resistant floor, which could prove particularly useful for those who have been gardening on damp or even muddy grass before entering the shed. This is also the cheapest shed to enter our top ten, making it excellent value for a shed that has a base width of 1.88m and a base depth of 1.10m. It’s only the lack of an extended warranty of any kind that prevents this good looking plastic shed from being placed much higher up the table. Whenever we see Grosfillex garden buildings, whether one of their plastic storage sheds as on this occasion, or one of their larger buildings that make a perfect home office or workshop, we’re struck by just how beautiful they are. It was good to see again, however, that this doesn’t mean that they have forgotten about the practicality as well. The first thing that grabbed our attention about this eight foot by seven foot model, alongside the exciting grey green colour scheme, was the large overhanging roof. It not only creates a lot of space inside the shed, it also creates a covered and shaded area outside the shed that can be an ideal place to relax and look out at the garden. Of course you can also watch the garden from inside the shed thanks to the two windows at the top of each of the double doors, and because they are relatively compact and have a high positioning it’s still difficult for anyone passing by to see what’s stored inside. This is however the most expensive of our top twenty plastic storage sheds, and at this price we would have liked to see a longer warranty period than ten years. If aesthetic appeal is one of your main concerns, however, and you have the budget to afford it, then this is certainly a shed to consider. Our next entry goes to the Rowlinson Tall Store, and once again it has a unique and yet attractive look. Like all but one of our top ten, it features an apex roof which gives it excellent weather proof qualities. On this occasion, however, the roof is green which contrasts very nicely with the cream white plastic panelling. Across the middle of this store runs another green stripe, and this includes the two handles which are used to open the double doors. 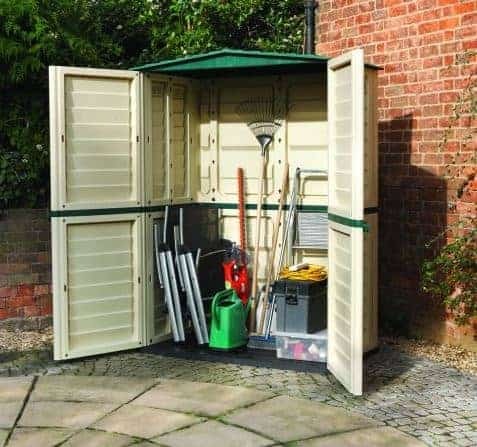 This is very much mid sized when compared to the other plastic storage sheds on our list, with a base width of 1.51m and a base depth of 0.83m, but it’s also tall enough to take rakes, hoes and strimmers without any problem. Looks wise this deserves to be placed much higher, but it was a little disappointing to find that it only comes with the one year warranty that is a statutory minimum. Nevertheless, with high quality plastic panels used we still feel it should prove to be a durable and very useful garden building at what is still a very reasonable price. 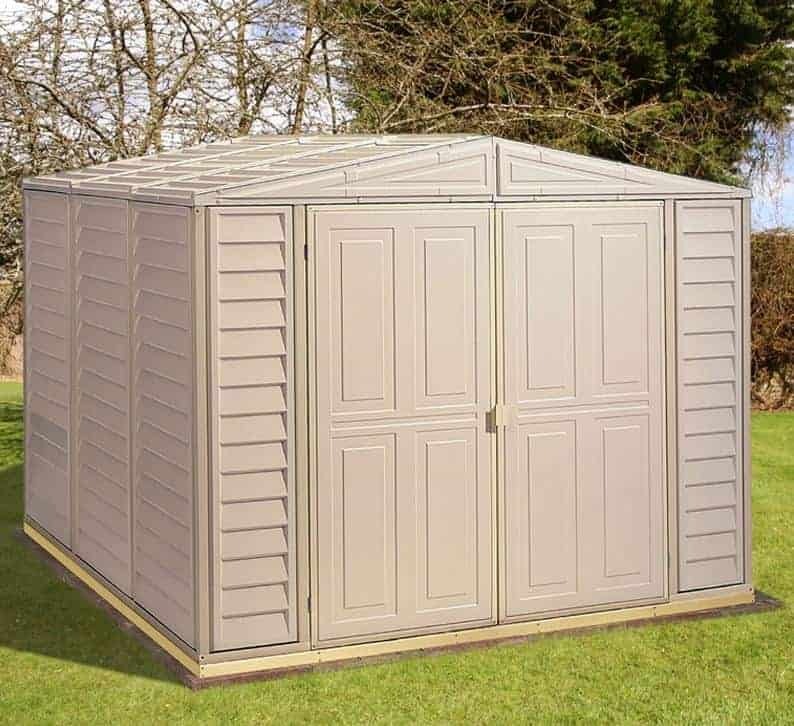 Out of all the plastic storage sheds that we’ve reviewed, this is the one that has the most timber like appearance at first sight, and as we know that will appeal to many lovers of traditional garden sheds this is enough to earn the final spot in our top twenty league table. We found its golden brown colour scheme very attractive, especially when combined with shiplap style cladding. Not only does this create the wood like effect, it also ensures that rainwater is kept out, so you can be sure that whatever you store inside remains dry. There’s one window on the side of this shed, and we were pleased to see that it’s made out of tough and shatter proof styrene. This is also a very cost effective form of glazing, of course, and yet this costs significantly more than most of the six foot by five foot plastic storage sheds that we review. We were also a little disappointed to find that it only comes with a one year warranty, which is the minimum allowed by year. 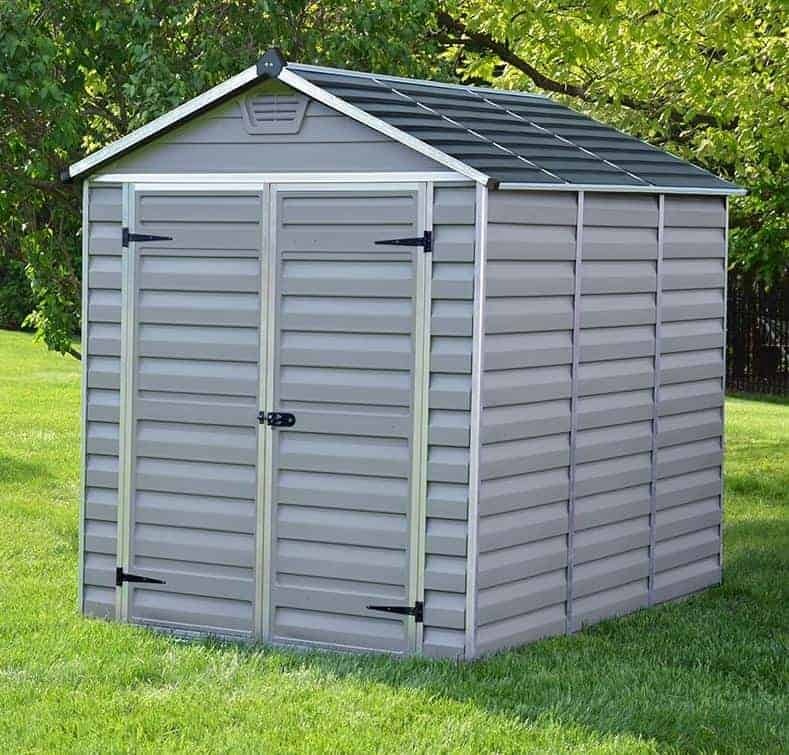 Despite this, we have little doubt that this shed will far outlast this warranty period, as it’s made from a high quality plastic that should prove to be very durable. If you want a plastic shed’s benefits with a timber shed’s looks then this could be one to add to your shortlist.